Oh how time flies. It just seems like yesterday that Marvel and Netflix announced their joint venture to bring Daredevil, Jessica Jones, Luke Cage and Iron Fist to the small screen. 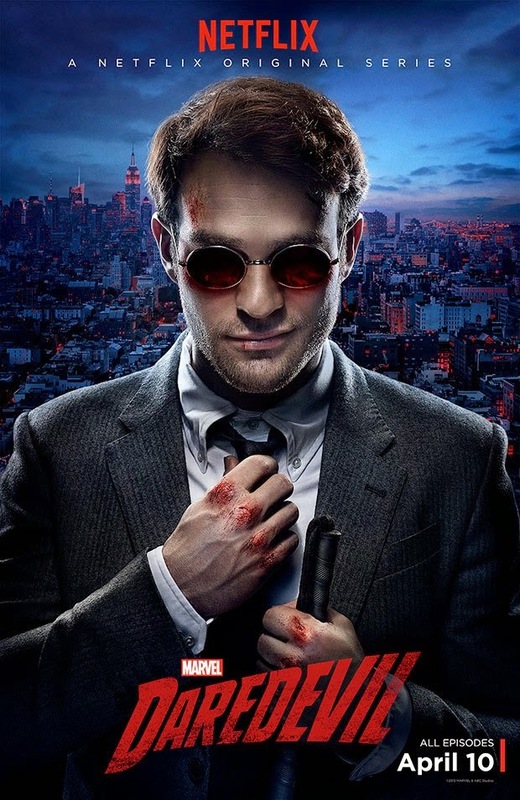 Daredevil shot in New York City between July and December of 2014 then premiered this past weekend with all 13 episodes dropping simultaneously. Early photos and teasers did little to boost confidence in the project as the black clad Charlie Cox seemed like not much of an update from Rex Smith's leotard from 1989's The Trial of the Incredible Hulk. The red suit kept being teased an on the eve of the premiere we got a glimpse of it's tactical and practical motif. Having been a fan of Daredevil in comics, in the Hulk TV movie and Ben Affleck's film version, I was pumped to do some straight Netflix'ing this weekend to see how things turned out. Marvel isn't dumb and Netflix routinely puts out superb original content so I was interested to see if they'd give audiences a slow burn crime drama disguised as a superhero show or a fast paced action hour that took itself a little too seriously. Seven episodes in and it's great. A nice mix of humor, drama and action. Basically we follow the Daredevil mythos set up by Stan Lee and Bill Everett along with Jack Kirby from 1964. Young Matt Murdock pushes an old man out of the path of a runaway truck carrying toxic waste. The truck crashes, containers open and spill radioactive waste on young Matt who is blinded but gains hyper sensory and "radar" sense. His boxer father "Battling" Jack Murdock pushes his son to use his brains instead of his brawn and after not throwing a fight, Jack is killed, leaving young Matt all alone. 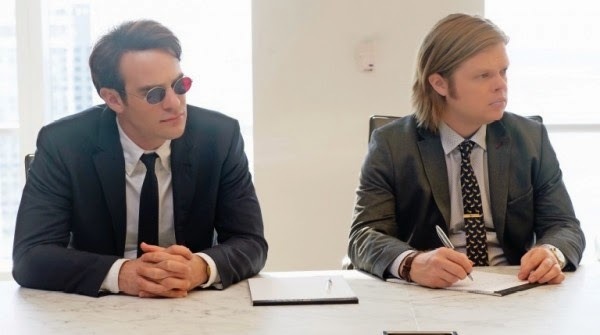 Cut to today and Matt is a lawyer along with buddy Foggy Nelson and the duo have opened a law firm to represent those who can't afford expensive legal teams. By night Matt fights thugs and organized crime to save his city, working his way up to Wilson Fisk; a giant of a man looking to save Hell's Kitchen in just a totally opposite fashion than Matt. We see Matt as a bit of an eager pup who has a lot to learn about criminals, being a vigilante and taking on several highly organized crime syndicates more or less all at once. The interactions between young Matt Murdock (Skylar Gaertner) and Jack (John Patrick Hayden) are particularly effective early on as "bum" Jack does everything in his power to take care of his son. Even at the detriment to his own life. Charlie Cox as the adult Matt is excellent as well; calm, odd and debonair with a lean yet beefy physique that looks capable of running around town fighting badguys but still able to hide under a suit and tie. Grown up Mighty Duck Elden Henson does a nice job of playing his less handsome and dashing friend and partner Foggy who half wants to go for the money but realizes helping others is important too. Vincent D'Onofrio's take on Wilson Fisk aka the Kingpin is a little sad yet menacing as we meet him in the surprising set up of a romantic relationship before watching him explode into mega violence on some gangsters. Deborah Ann Woll does a fine job as would be victim Karen Page who becomes Matt and Foggy's secretary and love interest while launching her own investigations on the side. 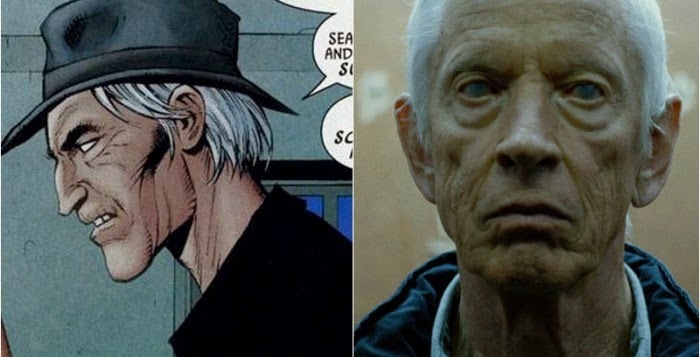 It's nice to see Vondie Curtis-Hall (Die Hard 2, Broken Arrow) as tired but determined reporter Ben Urich but the biggest surprise for me was Scott Glenn (Vertical Limit, The Right Stuff, Backdraft) as ninja/teacher/mentor Stick. Showing up in episode 7, Stick is like an amped up version of Rutger Hauer from Blind Fury mixed with Sam Elliott from Roadhouse. He's a blind badass who kicks, flips and sword fights while imploring Matt to cut loose of friends and comforts to fight the war on crime that only a few in society can.